There is no question that today’s power market is facing big shifts. Energy-related megatrends, technological advancements, and market disruptions are pushing this transformation. We see four opportunities to create the future of energy. Schneider Electric customers and partners are integral to shaping this future with us. As noted in the Energy Transitions Commission’s “Better Energy, Greater Prosperity” report, power decarbonization is essential to meeting our critical climate commitments. The ETC estimates that, combined with extended electrification where possible, reducing greenhouse gas emissions in the power sector over the next 20 years could achieve almost 50% of the reductions needed to stay below the two-degree trajectory. Microgrids represent one way to take immediate action. We can look to microgrids to deliver lower energy costs, promote more sustainable energy sources and demand-side energy efficiency, while offering grid resiliency. There are many wins here for power decarbonization, yet the capital cost of a microgrid is an undeniable consideration. There is a solution, however. 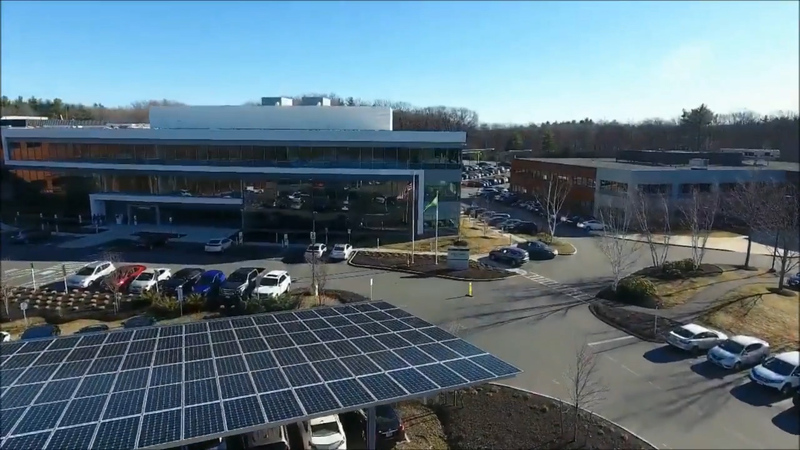 Unveiled on April 6, 2017, Schneider Electric’s own Boston One Campus (BOC) microgrid, for example, was financed through a Power Purchase Agreement (PPA) with Duke Energy Renewables and delivered “as-a-service,” reducing the upfront capital costs. Operating costs come into play here, too. The microgrid leverages connected hardware, software, and cloud-based analytics to help BOC optimize the operation and configuration of onsite energy resources. We can benefit from improve asset utilization and lower costs. The microgrid is expected to generate more than 520,000 kWh of electricity per year. In this case, the BOC microgrid is the result of a strong partnership between Schneider Electric and Duke Energy Renewables. There are other opportunities for utilities to stake a claim during this disruptive time. Competitive business models and advanced distributed infrastructure technologies are emerging. Pushing toward cleaner power and unlocking new business models are the common goals — not to mention that this move is a good defensive one for utilities to stay connected to the loads “prosumers” (professional consumers) are taking away from them. Increased growth of energy sources at the grid edge and on the demand side of the energy value chain are also changing the energy landscape. So, beyond decarbonization, microgrids are decentralizing energy, thanks to grid edge technologies such as distributed storage and solar PV, the lower cost of adoption, and attractive ROIs. At the Shedd Aquarium in my own “backyard” of Chicago, battery energy storage is helping Shedd to become the nation’s first clean-energy-powered cultural institution in the nation. Its goal is to cut energy use in half by 2020. Enhanced efficiency is brought on by digitization as well. In fact, from 2016 – 2025, the digital transformation has the potential to unlock $1.3 trillion of value for the electricity industry. Customers reap huge benefits from IoT advancements, foremost of which is agility. By empowering end users beyond the meter, digitization is changing the way large consumers procure and use energy. Digitization is the catalyst for improved situational awareness, which allows end users to solve their own unique energy objectives — enhancing energy efficiency, sustainability, resiliency, and security — in alignment with their business objectives. Schneider Electric’s IoT platform, EcoStruxure™, gives our building, grid, industry, and data center customers a powerful way to escalate their digital transformation. We agree with the ETC’s assertion that as power is decarbonized, further electrification is possible. Electricity use is expected to grow twice faster energy consumption. This more electric future bodes well for our climate — and for our customers. At Schneider, we cannot overlook the untapped potential of energy efficiency (EE). It is the one energy resource all countries possess in abundance, and the world is using only a small portion of the available supply. EE’s potential on the demand side is significant, with 82% unrealized potential for buildings, 79% for infrastructure, and 58% for industry. Innovative business models such as energy as a service, microfinancing in developing economies, and added value from energy and sustainability services (such as our own advanced energy monitoring service) accelerate the go-to-market path, helping Commercial & Industrial customers constantly save energy and cost. As with any disruption, change can be unsettling. At Schneider Electric, however, we are energy optimists, and we deliver realistic ways to make clean energy possible on a global scale. With our customers at the center of these huge shifts in the power market and grid edge transformation, we see many opportunities ahead. Let’s embrace them. Today energy saving is important.Energy saved is energy generated.Schneider is a leader in the field of energy .It must nurture the efforts taken at different levels in energy saving.Advanced Energy Management is a tiny company in India dedicated to developing simple energy saving devices and equipment.It has patented products and innovations.Bigger world wide companies can look at the products and technologies of such tiny but innovative companies like AEM and adopt their technologies for the benefit of the entire world where energy conservation is important.